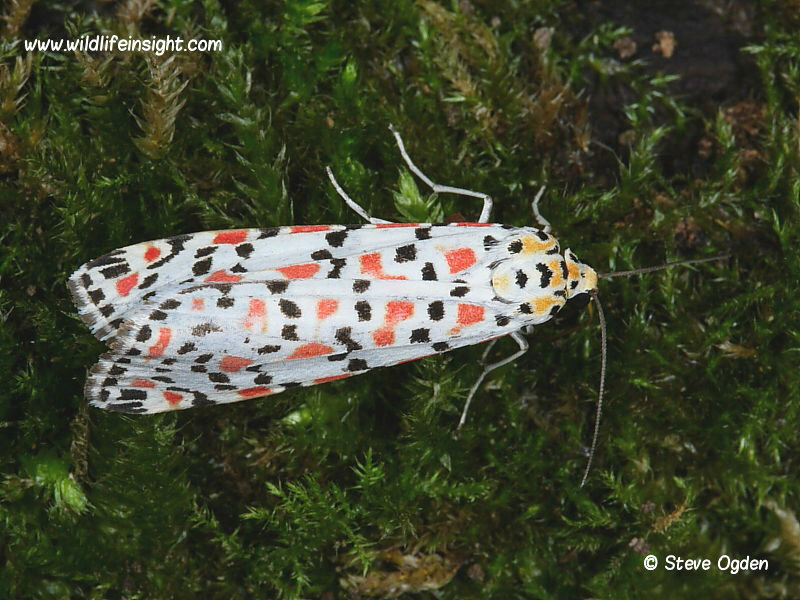 The Crimson Speckled is a rare migrant to the British Isles from North Africa and southern Europe. Most recordings occur in southern counties during September and October at times of favourable weather systems moving up from the continent. The specimen featured below was an unusually late sighting recorded on the 23rd November 2014. They are attracted to light and can be disturbed from grasses and low growing vegetation during the day. 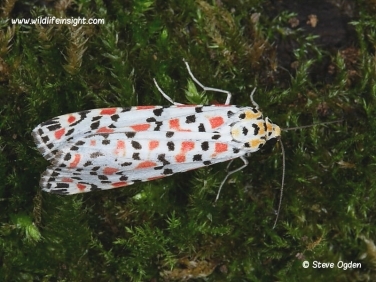 When seen settled this moth is unlikely to be mistaken for any other species in the British Isles. Colour intensity of the markings may vary slightly but its red, yellow and black markings on a white forewing make it instantly recognisable. 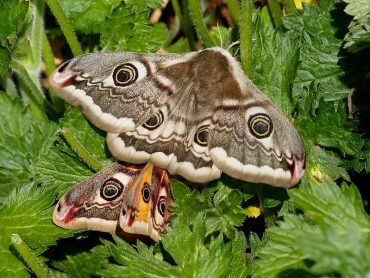 When attracted to light or found during the daytime it sits with wings folded close to its body. The length of forewing can be variable. The specimen shown at the top of the page was attracted to light in north Cornwall and had a wingspan of 36mm while the one featured right, recorded in a field beside the Helford Estuary, had a wingspan of 48mm. This large specimen disturbed from grasses appeared white in flight and the size of a Small White butterfly. It was only when we caught up with it and it was seen settled that its identity was confirmed. 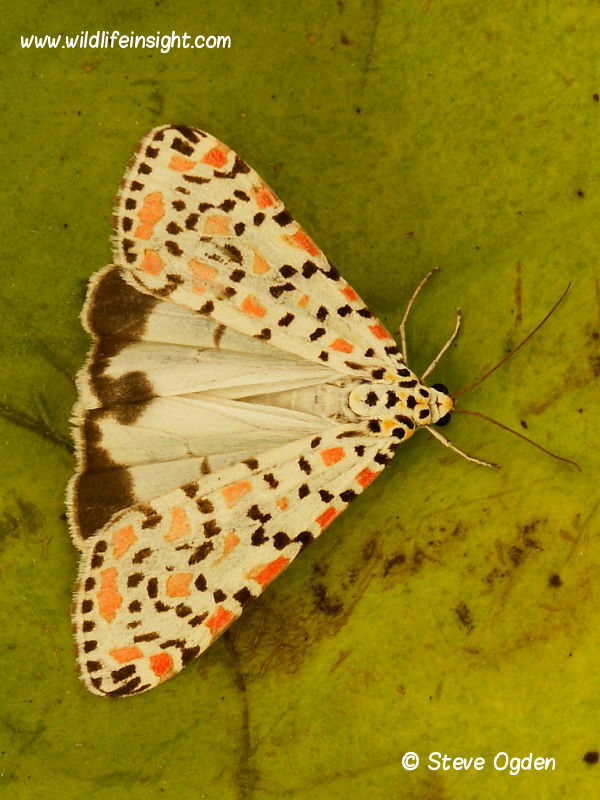 The hindwings are rarely seen but have a dark band close to the outer edge. 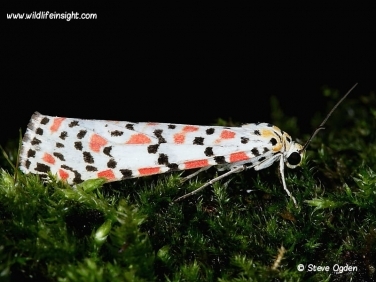 Records suggest that the Crimson Speckled cannot survive the British winters in any form – egg, larva, imago or pupa. Abroad in a sub tropical climate it is continuously brooded with the larvae feeding on various herbaceous plants. Field guide to the Moths of Great Britain and Ireland by Waring, Townsend and Lewington.